* Share God's precious promises with your little boys! A delightful way to introduce your child to God's faithfulness and love, this collection of Scripture verses, prayers, and whimsical illustrations of everyday scenes in a boy's life provide guidance and comfort as youngsters learn about faith, hope, and love. Ages 3 to 7. 32 pages, hardcover from Lion. Adults who are raising a child in the Christian faith will delight in sharing these promises of God's love with the children who are dear to them. Each spread has a Bible verse and a related prayer to convey the message of God's care, wisdom, and strength, with words chosen to guide and comfort, full of faith, hope, and love. Illustrated throughout with endearing pictures of everyday scenes in a little boy's life, this little book makes an ideal gift for a special child. Mary Joslin is the author of The Lion Book of Best-Loved Prayers, The Lion Book of Day-by-Day Prayers, The Lion Day-by-Day Bible, On That Christmas Night, Simon and the Easter Miracle, and The Story of the Cross. Ruchi Mhasane is a children's book illustrator. 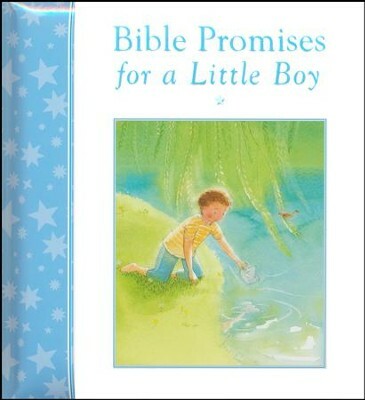 I'm the author/artist and I want to review Bible Promises for a Little Boy.